Ensemble singing has always been an important part of traditional campus life at Haverford and Bryn Mawr. The bi-college community is home to an unusually large variety of singing groups embracing a wide range of musical styles. The Chamber Singers and Chorale are directed by Nathan Zullinger. There are also a number of independent ensembles directed by students and members of the community. A mixed choir of 30 voices who perform challenging repertoire ranging from the Renaissance to the present day in a variety of languages and styles. Rehearsals for Chamber Singers are Monday and Tuesday afternoons in MacCrate Hall (Haverford) from 4:30-5:50 and Thursday afternoons from 4:20-5:40 in the Music Room at Goodhart Hall (Bryn Mawr). Visitors are always welcome at rehearsals! For further information contact Nathan Zullinger nzullinger@haverford.edu. Dawson - Ain' a that good news! Dawson - Behold the Star! Hogan - Didn't my lord deliver Daniel? Ramsey - Wilt Thou Unkind Now Leave me? Smith - Ride the chariot! Saturday, November 3, 2018, 8:30 p.m.
Thursday, December 13, 2018, 8:00 p.m.
Thursday, May 2, 2019, 4:45 p.m.
Friday, May 17, 2019, 8:30 p.m.
Is it possible to belong to Chamber Singers and/or Chorale and belong to a student a cappella group? Yes. About 1/3 to 1/2 of Chamber Singers each year are members of a cappella groups, frequently including the music directors of those groups. A large number of such students also sing in Chorale. 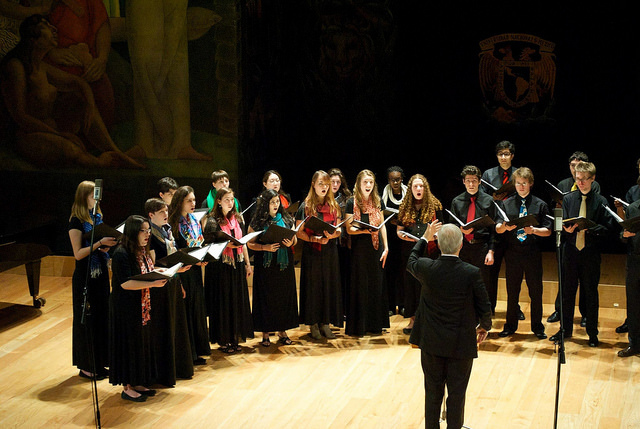 Is it possible to belong to Chamber Singers or Chorale and participate in a varsity sport? So long as meets or games don't conflict with more than two Wednesday night rehearsals a semester or with the final performance, varsity athletes have frequently sung in Chorale. Because Chamber Singers rehearses Mondays, Tuesdays, and Thursdays from 4:30 to 6:00 it is difficult for varsity athletes to belong to Chamber Singers. However, with tennis and cricket at Haverford arrangements can be made where a singer/athlete can miss one rehearsal and one practice a week and still do both. With so many more women than men between the two campuses, how hard is it for women to get into Chamber Singers? Yes, auditions for women for Chamber Singers are very competitive, but there are always openings each year because of seniors graduating and juniors studying abroad. Several first year women make the group each year - you don't have to be a music major to have a chance; most women with a strong choral background are able to get in in either their freshman or sophomore year. The Chorale is a Wednesday night institution in bi-college life. An oratorio choir of 120-150 singers, the Chorale performs a major work with orchestra each semester under the direction of Nathan Zullinger. Members include bi-college students, faculty, staff, alumni, and friends from the surrounding community. The orchestra is usually made up of advanced bi-college musicians supplemented by music students from Curtis and Temple. Soloists have included students who are members of Chorale, Chamber Singers and guest artists. Rehearsals are Wednesday evenings from 6:50 - 8:50 in Marshall Auditorium (HC). Visitors are welcome at rehearsals. Sunday, December 9, 2018, 3:00 p.m.
Auditions for Chamber Singers will be held September 4–8 by appointment on both campuses. The audition consists of singing five-note scales for tone quality, range, and intonation, matching several 3 or 4 note sequences of pitches after hearing them played on the piano, and sight-reading a passage from the planned repertoire. Auditions for Chorale will be held on September 4–8 by appointment on both campuses. New community members may audition on Wednesday evening, September 5 at Haverford. The audition consists of singing five-note scales for tone quality, range, and intonation, matching several 3 or 4 note sequences of pitches after hearing them played on the piano. Students can take private voice lessons for one-half graded credit per semester, either with one of our teachers who regularly teach on campus or with any teacher in the greater Philadelphia area into whose studio you are accepted and whose credentials are approved by the Music Department. Students must audition for and be accepted into either Chorale or Chamber Singers to be eligible for taking lessons for credit and partial subsidy. Students who have sung in Chorale previously do not have to re-audition, but must continue in Chorale during any semester they are taking lessons. If you already know the teacher with whom you wish to study, contact him/her directly as soon as possible to arrange lessons. If you’re not sure which teacher to study with, inquire with Prof. Zullinger or call one of the teachers to arrange a brief meeting or trial lesson individually. In order to receive credit and be eligible for partial subsidy for lessons, you must register with both the college Registrar (course number MUSCH209) and with the Music Department through the online departmental registration form. To receive credit for the semester, students must complete a minimum of 10 lessons, attend voice classes with their teacher as announced, and sing a jury at the end of the semester, to include two contrasting classical art songs or arias performed from memory. Musical theater songs can be studied in lessons during the semester but cannot be one of the two jury selections presented without special approval from Prof. Zullinger. Your final grade will be determined by Prof. Zullinger and at least one other member of the music department faculty based on your performance at the jury and the evaluation of your work during the semester by your teacher. Emphasis will be placed on your technical and musical progress since the beginning of the semester and your mastery of the songs performed at the jury. Are voice lessons for credit covered by regular tuition? Unfortunately, no. As with most smaller colleges, the size of the faculty is too limited to include private teachers for voice, piano, and orchestral instruments, so the student pays the teacher directly. However, a special alumni fund is available to help subsidize the cost of lessons. Lessons tend to run $75 per hour lesson, with 10 lessons per semester required to receive credit. Subsidies range from $150 - $350 per semester depending on student involvement in the program (Music majors/minors receive more subsidy). Are there other opportunities to study vocal literature? There is an Art Song Seminar (MUSCH219) taught each Spring semester for one half graded credit. In this class, singers learn the basics of German and French diction, the use of the International Phonetic Alphabet (IPA), and gain a familiarity with the musical style of German lieder, French chanson, and art songs by American and British composers. Are there opportunities to study conducting at Haverford and Bryn Mawr? Yes, you can take an independent study course with Nathan Zullinger in conducting and gain experience as an assistant conductor with Chamber Singers and/or Chorale. Students have regularly conducted both ensembles in performance and on tour. Is there any difference in singing opportunity for women depending on whether they attend Haverford or Bryn Mawr? No. The only exclusions of any kind in vocal ensembles would be a few of the student-led a cappella groups which are restricted to students from one school or the other (such as the Night Owls at Bryn Mawr and Oxford Blues at Haverford). Rehearsals and performances regularly take place on both campuses, which are only five minutes away from each other on the Blue Bus.